The following has been taken from Landscapes And Lives which was a free publication from 2006. With thanks to Shaun Haydon, Liz Constable and Peter Mayne for permission to publish this information. In this section, the idea was to pick out twenty or so "nuggets" from the old school log books, a seemingly unenviable task, given the many events described therein. In the event the exercise turned out to be one of the most interesting this researcher has ever undertaken. Time would not allow the reading of every page of the eight books, which cover the period from 1863 to almost present day, so it was a case of "dipping in" and in doing so picking out the best, which will hopefully interest the reader. 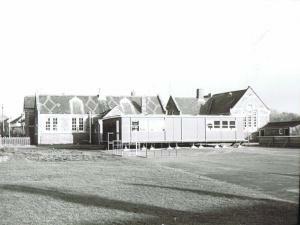 The original building housing the National School was located on the High Street, adjacent to where the vicarage is now. In 1861 a new school was built at the bottom of School Lane, and it became a Wesleyan School. In approximately 1883 the "new" school was enlarged and the National School closed, and in 1893 the school was taken over by a School Board.The present school was built in 1988. There are two sets of books. The first set covered the Infants Department (age range appears to be 5-7) from 1891-1938. There was a concurrent set of logs dating from 1863, which covered the Mixed Department (aged from 7+). The two departments combined in September 1938 and continued in further volumes Until December 1999. "There has been an increased attendance this week compared with last week owing to improved weather. Average for this week 62.7." "Only 26 children attended school 10 times this week. There are 104 names on the books." "School closed for 4 weeks on account of scarlet fever." The school was closed for the day this being the occasion of the wedding of Princess Mary." "I have permission from Mr Wallace to take the children of the first class into the upper school at 3oclock this afternoon, that they may be present at the unveiling of the memorial placed in the school in memory of the boys who passed through the school that gave their lives in the war 1914-1918." "Owing to the fact that a new boiler is being put in today, work according to the timetable is impossible and the morning has been devoted to games, stories and songs. On the advice of Mr W E Wallace, the school will be closed at noon for the rest of the day." "The timetable was suspended during the morning and the time devoted to lessons and other forms of observance suitable to the occasion. The public funeral of His Late Majesty King George V. The school was dismissed at noon for the day." "The school will be closed for the rest of the week to celebrate the coronation of Their Majesties King George VI and Queen Elizabeth." "The department and the mixed department are now amalgamated to form Eaton Bray Junior School and the log book of the mixed department is in use from this date." "This morning gave a lesson on Palestine. Arithmetic examinations in the afternoon. Attendance poor." "A notice was issued by the Leighton Buzzard Union announcing that the children may have 6 weeks holiday now. As several of them have already had some 4-5 weeks, this will make 12 or 13 weeks in the year. This does not appear to me in agreement with the Education Act." "In consequence of the National School being closed, we have had a considerable number of new scholars entered this week. Several of our old scholars have not yet returned after the Harvest Holidays." "During the past fortnight it has been impossible to collect the school fees. Some children have been sent home five or six times in the week but no fees have been paid, others sent home on the Monday morning have not presented themselves during the week again." "Owing to the demand for female labour in the nurseries, school has opened at 9. No bible lesson or play. Closed at 11.30 opened at 1 and closed at 3.15. This arrangement permits the girls to do several hours work in the evening and probably makes the attendance more regular." "School reopened under the following notice.Eaton Bray School Board. The Wesleyan Day School will be reopened on Monday next under the management of the School Board. By Order, Alfred Blake, Clerk of the Board." "Child X was canned today for having dirty hands. This lad and his two sisters are a disgrace to the other children in thrir respective classes owing to parental indifference to their appearance." "The attendance this afternoon is low as several of the children have gone to the steeplechase at Billington." "Electric lighting has been installed during the holidays." "Mr Brown having retired on September 4th I, Emily Medley (Mrs) take charge of Eaton Bray Junior School which consists of Eaton Bray Mixed Department and Eaton Bray Infants which have now been amalgamated." "The school was closed today on the occasion of Queen Marys visit to Luton to open the Luton and Dunstable Hospital." "Souvenir mugs presented by the Education Authority were given to all children to commemorate the Coronation on June 2nd of Her Majesty Queen Elizabeth II. Three days extra holiday are given for this great occasion, so the school closed at noon to celebrate Empire Day, then Whitsun Holiday, followed by the Coronation." "Inaugural meeting of Parent-Teachers Association. Well attended and much interest was shown in matters educational, social and fund raising. A committee was elected to arrange programme for this year. One meeting per term." "Mr Piggott phoned with news of purchase of land for playing fields and eventually we hope, a new school." "School closed for the move to the new building. Everyone worked extremely hard and the move was completed by 12.00. This afternoon was spent in unpacking and sorting." "Saturday! Most staff were working to get ready for the children on Monday. The school is looking lived in already. Mr Peter Mayne came to fix a plaque to commemorate the opening of the new building." "Last day of term and the last day for me (Carolyn Birch) as head of this school! I retire this month." Our history of mills starts with a very personal tale from a lady who still lives in the village today, the last millers daughter. "Doo Little Mill is a Grade II listed building and is one of only a few combined wind and watermills in the country. The mill has five floors, the watermill occupying the bottom two and the windmill the top three. There may also have been another floor originally. The windmill originally had two pairs of stones, of which one cullen bedstone remains. Not much of the mill machinery is left only the solid wooden wallower, the mainshaft and the spur wheel.The cast iron windshaft was discovered being used as a support for the floor above the waterwheel. The watermill had two pairs of stones, one peak and one burr both of which remain. Much of the machinery and gearing has survived. Unfortunately some machinery such as the winnower has fallen into the wheel pit. The sails were blown off in a violent storm in the late 19th century possibly 1868. A photograph dated 1858 has survived showing the combined mill still with its sails intact. A steam engine was used to power the mill in its later years which was housed in a building alongside the wheelhouse but unfortunately the steam engine became unusable in 1921 and since that time the mill has virtually stood silent. Early documents which have survived show that a mill has stood on or near the site since mediaeval times. The first recorded mill owner was Edmund Buckmaster who leased the mill to Francis Ashwell for 99 years. That was in 1620 and at this time the mill was known as Horsham Mill. The mill was bought and sold many times and some owners were never millers. Some owned other mills and let Doo Little Mill to tenant millers. Years later a miller from Slapton, Thomas Buckmaster, bought the mill for £188 10s 0d and also acquired the lease of "Mill House and Watermill" called "Horsham Mill" from the widow of Henry Pearson. Henry had left his wife the mill and cottage in 1769. It was at this time that the name of Doo Little Mill first appeared and has remained ever since. It is thought that early in the 19th century, Thomas Buckmaster and his so Christopher decided to combine the wind and water power in one mill. The last miller was my father John Buckmaster Linney, who always hoped the mill could be restored but he died never realising his dream." Mr and Mrs W E Wallace came to Eaton Bray in 1886 and started a general nursery with four glazed over duck houses. From 1904 success with the perpetual flowering carnation made W E Wallace a leading name in the trade. The local Sharrett family building firm constructed a new greenhouse for Wallace roughly every two years , each one 200—250 feet long by 45 feet wide. From the Chiltern Hills they appeared as an eight and a quarter acre sea of glass. In 2006 one 300 foot greenhouse remains , overgrown but still visible at the end of The Comp. Just opposite that greenhouse there was a huge water tower (eventually demolished in 1996) whose engines pumped 80,000 gallons of water from three 300 feet artesian wells to supply 450,000 continuous growing plants , tended by 100 employees. In a good year , it is reported that 10,000 dozen blooms a day were dispatched all over the UK , another reason for Stanbridgeford station being so busy. After closing in 1974 , the nursery land was given over to housing development and street names there reflect the industry that preceded them. The Wallace 500 acre farm and fruit trees were a separate entity where gifted gardeners grafted thousands of the apple stock to produce vast crops. As the significant local employer , Wallace carried a huge influence in the village. Employees were worked hard in the Wallace empire and , as you might expect , not all were the greatest friends with their boss but , generally Wallace is perceived to have been a great benefactor behind many generous acts to support the village. More detailed stories of the Wallace era in Eaton Bray would make a whole book on their own. Years ago Eaton Bray was awash with ducks. Arthur Holmes put carcasses that had been ordered by postcard onto a bus that would be met by a Luton hotelier within the hour. Ducks were even driven loose to Stanbridgeford Station and dispatched live by rail. The largest breeders were Maud and Ezra Tompkins in Moore End. Rows and rows of orange boxes nested broody hens sitting on twelve eggs for twenty-eight days throughout the spring months to produce an average two to three thousand ducks a year. Plucking commenced at 5am daily and by 8am wicker baskets were loaded onto a horse driven cart destined for Stanbridgeford. To give some perspective on how Eaton Bray has changed during the 20thC, Maurice Sanders was asked to reflect on what he had seen in his lifetime. Maurice was born in a house on the High St in 1922 and at the time of writing this he was still living in the same house. So, he is well qualified to comment on the change seen around him and his home. Until a relatively short time before Maurice's birth, Eaton Bray and the surrounding area were part of feudal lands operated by lords of the manor, an arrangement common to many parts of Britain. However by the late 19thC, land ownership was spread more widely and the effects of change were a primarily agriculture to industrial society were evident. Thus, the foundation was laid for a century of accelerated change as witnessed by Maurice, and fresh in his mind from anecdotes by the generation of his family before him, with whom he grew up in Eaton Bray. His grandfather, James sanders, ran a family business in which Maurice's father was amongst four siblings assisting in pig and poultry dealing. The Lodge at the top of Northall Road, had previously belonged to the Pedley Estate based at Billington Manor, but was rented and eventually bought by James Sanders in 1915 for £860. With people not moving around the country as much as they do today, an extended family of uncles, aunts and cousins were all active in the local area in various forms of work. Maurice himself worked in the timber haulage trade, before becoming self employed in 1954. Purchasing the first chain saw in the area, he cut down thousands of non-productive fruit trees, and also planted thousands of woodland trees. His stories tell of a close acquaintance with many people in the village in all kinds of trades, at a time when mass transportation by road was in its infancy. The generation before him were mainly used to transportation by horse and cart, and Maurice experienced that as he grew up. Local industry was strong with busy mills and nurseries, ducks and other livestock, plums and other orchard fruits, and plaiting as a spin off of the Luton millinery trade. Alongside this, there operated ancillary trades such as blacksmiths, mechanics, and haulers that supported them. Some excerpts from Maurice's book bring this summary of change to life. "Grandpa had two maiden sisters, Temperance and Phoebe, who lived in a lonely cottage a mile outside Northall. The honeysuckle, snowdrops, neat box hedge, the four- poster bed, cats-whisker wireless, and kettle on the hob leap fresh to mind. The sisters were Sunday School teachers, Cattle Minders, and Seamstresses with clients in London. They were most adept with the pitchfork, both in the field and as a means of self-protection. In fact when two Italian prisoners of war were caught in their henhouse, they rounded up the whole gang and held them at fork point, pending police intervention." "Stanbridgeford railway station was about a mile and a quarter from Eaton Bray. Nearby Totternhoe Knolls, then a tourist attraction, had my aunt, father and others meet the trippers with waggonettes. Porter, Tom Goodyear took calculated risks holding the crossing gates for traffic as trains bore down on him." "Eaton Bray men crewed a National bus kept at The Chequers Inn. On cold mornings we would down to help start it, and were expected to dismount and push it up Lancot Hill when slippery. In return, before bus stops, the driver would toot an absent regular, and the conductor might come to your door. The bus once reversed 60 yards when passengers announced one young lady was not on board." "My father tended poultry and reared many pigs. Jews from London would buy thousands of quality chickens. One, a Mrs Goldsmith, visited and paid cash carried in the leg of her knickers." The Post Office, Bert Bunker, A Roberts, The Vicar, F Tooley, A Thorne, W Wallace, C Janes, PC Hebbs and J Sanders." "Eaton Brays first motorised wheels were the Rev Suttons (Scout) car, and Mr Wallaces (Morse MH4854) a touring car during WW1. Sid Copperwait opened the first garage and petrol pump, long before the Robuck Garage, now incorporating the old Bedford Arms Inn." "Our various constables nipped young offenders in the bud with a swing round the ear from their capes. One Eaton Bray youth, who felt unfairly accused of fatherhood after consorting with a young lady of easy virtue put it to the Magistrate this way. (If you fell down in a bunch of nettles could you prove which one had stung you Sir)." The mills and nurseries survived through the two world wars but by the 1960s the villages were fading as commercial centres in their own right,, save for small specialist shops and the general stores and post offices. Changes in working patterns have seen people living in Eaton Bray and around, but travelling to work that is now centred on towns such as Dunstable and Leighton Buzzard, and further afield in Milton Keynes and London. The landscape of tall mill towers, greenhouses, and sprawling farms has been replaced by housing to meet the demands of people whose work lies in urban areas, but still want to live in essentially rural environment. Amongst that change, it would be good to maintain some perspective on the events and locations that the likes of Maurice grew up with. For many people, the opportunity for a friendly word with the local postman is a cheery start to the day. Some older village residents were kind enough to extend this chat further, and pass on some recollections of days gone by to give another flavour of village life.